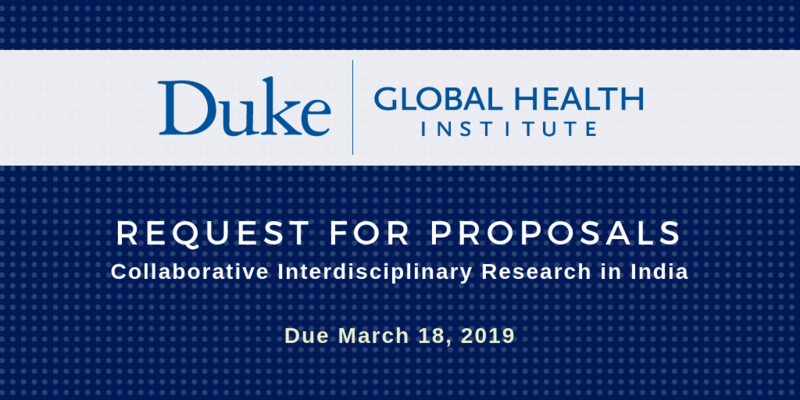 The Duke Global Health Institute (DGHI) invites research proposals building collaborative interdisciplinary research between DGHI investigators and partners in India. Our goal is to enable investigators to leverage preliminary findings and pilot data to obtain larger awards of external funding. Proposal teams must include at least one DGHI faculty, and one researcher from India. Proposals including two or more collaborating sites are encouraged. Proposals may include collaborators from other institutions as well. Junior faculty and faculty new to global health are strongly encouraged to submit proposals. The budget may include: supplies; publication costs; salary support for technicians, research assistants, and graduate students; research related travel; and other justifiable research expenses. Faculty salary, travel to scientific meetings and indirect costs are not allowable expenses. Applicants may apply for up to $25,000 for one year. Smaller proposals for shorter periods are also encouraged. Applications must propose global health work in India. Applicants should describe plans for how the results generated will be applied to obtain future external funding. Curriculum vitae OR NIH biosketch for each investigator including current grant support and limited to five pages for each investigator.